Dallas Orthopaedist Dr. Jorge Casas with the Dallas Sarcoma Associates, talks about when reconstructive surgery is needed after an infection occurs. Dr. Jorge Casas talks about the different types of bone tumors and who is more likely to be diagnosed with a tumor. Most bone tumors show no symptoms, but sometimes patients can experience a dull and aching pain. 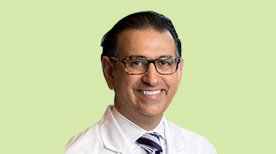 Dr. Jorge Casas answers the question: "I'm having pain after joint replacement surgery, should I be concerned?" Dallas Orthopaedic Oncologist Dr. Jorge Casas with the Dallas Sarcoma Associates talks about reconstructive hip surgery on the Best Docs Network- Dallas Fort Worth. The pain Don experienced in his hip was so bad, he became unable to walk. Watch as he talks about his experience with Dr. Casas and how he helped change his life.